Radon is a Class A carcinogen, which means it has a known effect on humans. Radon is a natural radioactive gas. Not only is radon colorless, odorless, tasteless and chemically inert, radon is also the second leading cause of lung cancer. The first being smoking, this makes radon the number one cause of lung cancer in non-smokers. Radon comes from the breakdown of uranium in the soil, when a structure is built on top of the soil it becomes a trap for radon. HOW DO I KNOW IF I HAVE RADON? There is no way to know if you have high radon without testing for it. There are several types of devices to test for radon. You can test short term (2-7 days) or long term (minimum of 90 days). At Peoria Radon Testing, we use a Radalink Aircat monitors. This monitor is a continuous radon monitor capable of short term testing. Our clients are provided with same day results on test preformed Monday-Saturday. ​Radon test kits are available at most hardware stores and even free by contacting the Illinois Radon Hotline provided at the bottom of this page. Testing the home that you own is acceptable. However, the homeowner test kits will not give you certified results. Testing yourself also leaves room for a false reading. The homeowner would need to be mindful of closed-building conditions and proper test placement. As a professional tester, the results we issue are certified for up to 2 years after the measurement has been taken. All real estate transactions or results intended for business purpose require certified results from a measurement preformed to IEMA protocol. As a mother of 3, Abby knows how important it is to protect yourself and your loved ones from threatening health issues. Abby is proud to have taken the necessary steps, along with being a non-smoker, to protect her lungs, and the health of those around her. She is very motivated to make your home a healthier environment for you and your loved ones. Abby obtained her Radon Measurement license in January 2015. She is looking forward to helping you take the necessary steps to help ensure a bright future for your children and the loved ones you hold dear. Looking to have your home or business tested for radon? Let Abby make that process as quick and easy as possible. HOW CAN I HELP WITH THE TESTING PROCESS? 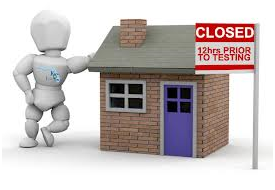 It is important to keep closed house conditions 12 hours prior to the test being set, and to maintain those conditions during the test. It is important to not touch, move, bump, or tamper with the machine in any way. Doing so will result in a invalid test that you still get charged for. WHAT ARE CLOSED HOUSE CONDITIONS? WHAT DOES IT COST TO TEST? Cost is dependent on foundation type and square footage of your home. According to IEMA protocol, one monitor is needed for every 2000 sq ft of foundation. A machine is also required for every foundation type. So for example a house with a 1200 sq ft basement would need 1 machine. If you add a sunroom to this house on a slab, another machine would be required for the sunroom that sits on its own slab. WHAT HAPPENS IF MY RADON IS HIGH? Dangerous levels of radon are considered anything over 4.0 pCi/L. Should your results come back over that, your next step is to contact a Mitigation professional.